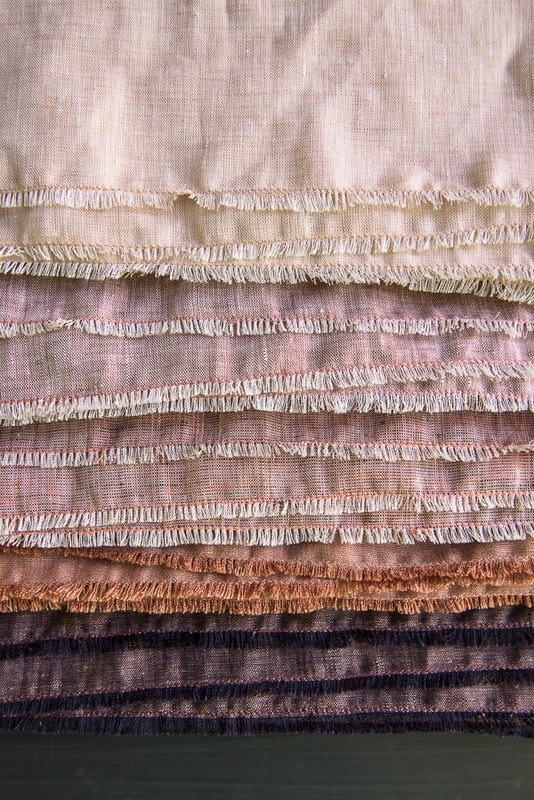 Purl Soho’s new Watercolor Linen is a truly special fabric. 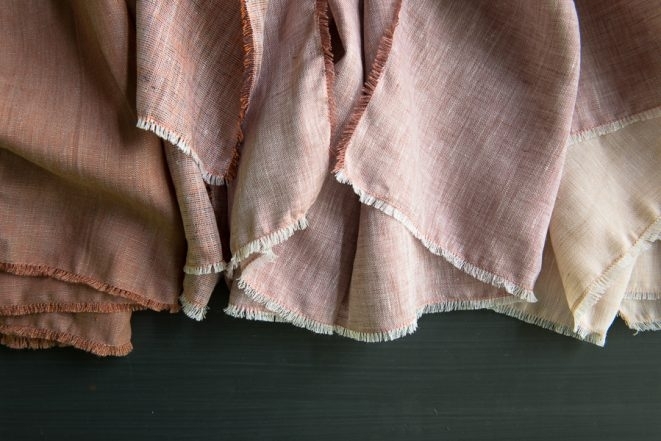 This crisp, cool 100% linen uses one color as the warp (the threads that run vertically down the fabric) and another as the weft (the horizontal threads that run from selvage to selvage). The result is a field of intersecting threads with a rich and unique depth of color. Sometimes the best thing you can do with a stunning fabric like this is let it be. 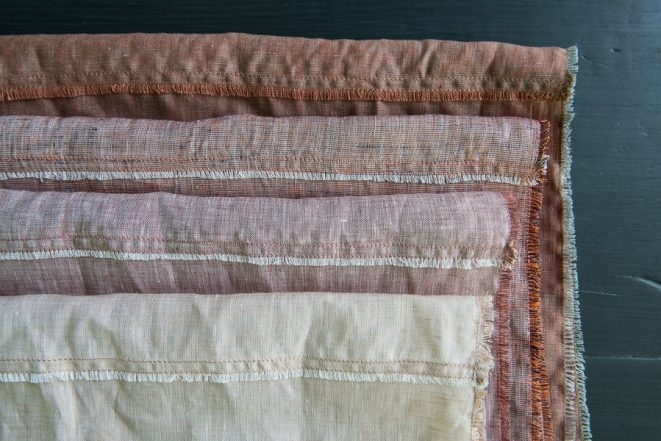 These Watercolor Linen Wraps contain just the right amount of detail without getting fussy. 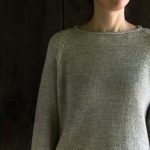 Simply by pulling threads you create fringe on all four sides, exposing the contrasting warp and weft for what they are, pretty little surprises! Sew a quick exposed seam up the middle, and voila, your new favorite wrap is born! 1 yard of Purl Soho’s Watercolor Linen. We used, from left to right, Wisteria Stem, Smoked Rose, Baked Clay, Rose Quartz, Monarch Gray and Pink Sand. A 110-yard spool of Gutermann’s Cotton Sewing Thread to match the fabric. We used colors, from left to right, 6050, 5610, 4660, 4680, 5410 and 5500. 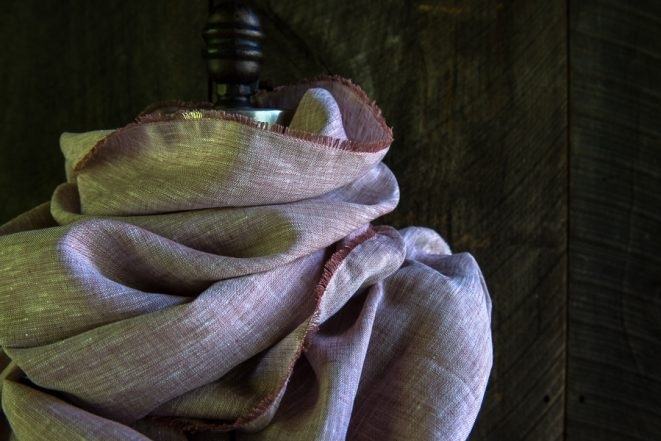 For the free pattern, please visit our original Linen Gauze Wrap story. How wide is this fabric? Does it come in different widths? This fabric is 58-60 inches wide and only comes in this one width. Thanks for your question! Hi! 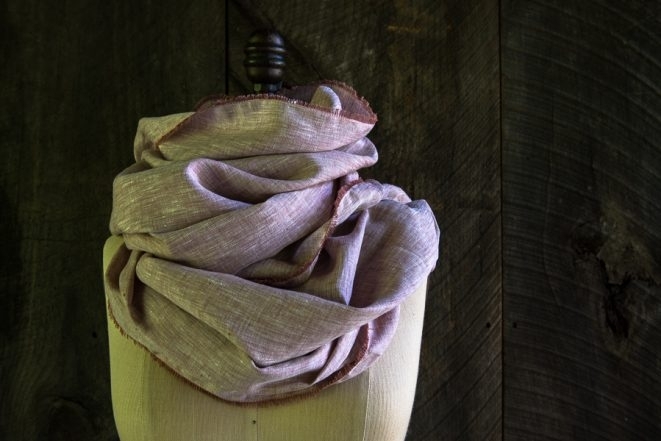 I’ve been looking for a light summer scarf and this project may fit the bill! Can you tell whether or not the linen will look as good crumpled/creased? And how is the feel of the fabric (especially since it will be around my neck)? 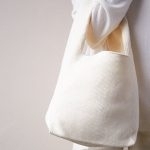 I know some natural linen can be scratchy. Many thanks! It looks great crumpled! The shots of this hanging are slightly crumpled, so you can see it a bit. The fabric is not scratchy AT ALL and would be a perfect summer scarf! Could you please give us a suggested Gutermann Cotton Sewing Thread color for each of the Watercolor Linen colors? This information is listed in the materials list. Please look it over and let me know if you have any more questions! What color is used for the wrap that is on the mannequin? Also, in the rotating set of pictures at the top, in the 6th picture (3rd picture after the closeup of the mannequin), there is a wrap that has purple threads on one edge, and lime green on the long edge. It’s on the left, next to a very dark wrap. What are those two colors? (The lighter one with green threads, and the darker one). Thanks! Thanks for writing in! 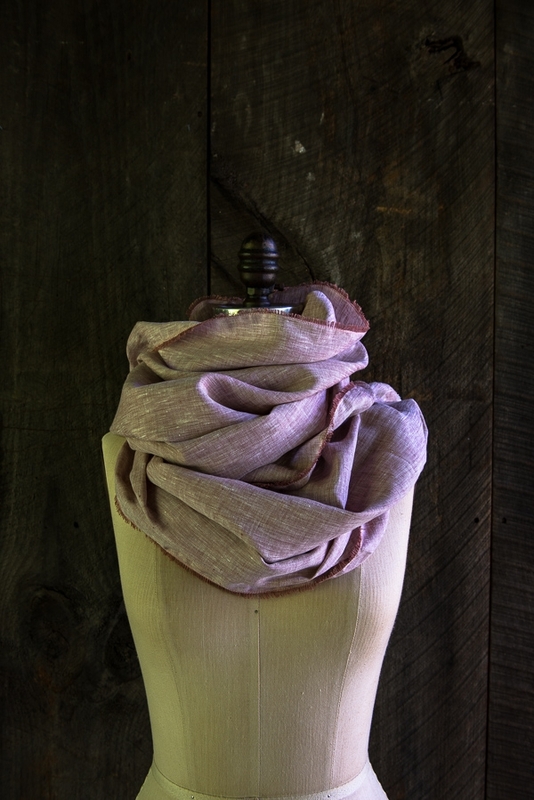 The scarf on the mannequin is the Rose Quartz color. The purple and lime is Wisteria Stem. 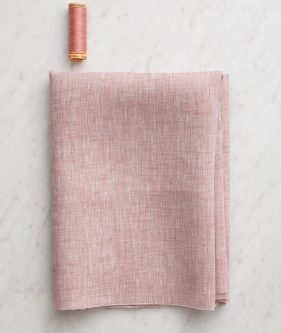 Is there a coordinating Gutermann cotton thread color that you recommend for the “pink flame” watercolor linen color way? Thanks for your question! The matching Gutermann color for “pink flame” is 5160. 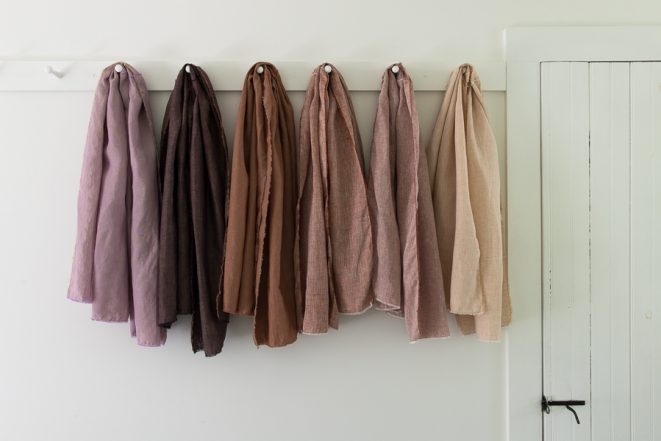 This linen looks wonderful and the tea towels and apron would make a great Christmas gift for my peeps. Do you have any retail stores in Canada? These are beautiful! What thread color should I use for the Faded Indigo and the Sugar Plum? Thank you! Thanks for writing in and for your kind words! To match Sugar Plum, we suggest Gutermann 6080. To match the Faded Blue, Gutermann 9280 or 7510 would match well! Thank you so much for the quick reply! You are terrific! 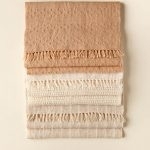 I have received my order of the Watercolor Linen to make the scarf/shawl for my daughter for Christmas. The fabric is lovelym and the instructions are straight-forward. I cannot, however, locate the thread. For the Monarch Grey you suggest Gutermann cotton thread #5410, but I cannot find this color at my local fabric store. I’m assuming this is a discontinued color. Can you suggest an alternate? Many thanks. If your local store does not carry Gutermann or is out of color 5410, you can certainly bring the fabric in and see what color works best with it. This fabric is absolutely gorgeous! 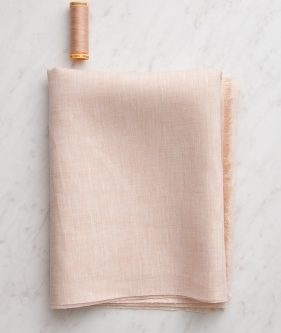 Question: the pattern was originally for linen gauze fabric, and it recommends not prewashing it. Is the same true when using Watercolor linen? Thank you so much for writing in! The same goes for the Watercolor Linen, do not prewash. The finished wrap will be hand-wash only. Please let us know if you have any more questions! Why do you recommend not prewashing the fabric? I have some linen I’ve already washed and dried I’d like to use for a wrap if I can. As for hand vs. machine wash afterwards, is that because the resulting wrap is too delicate? 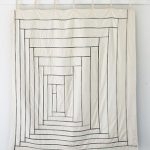 Should we stitch the center seams and perimeter twice for the linen wrap, as is called for in the gauze project? 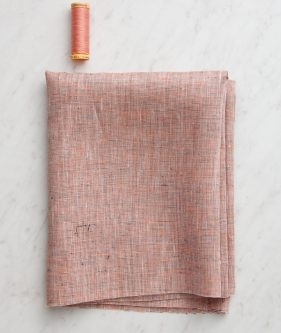 I noticed in the fringe linen napkin project the directions only have you stitch once so I wanted to check. Thanks for writing in! 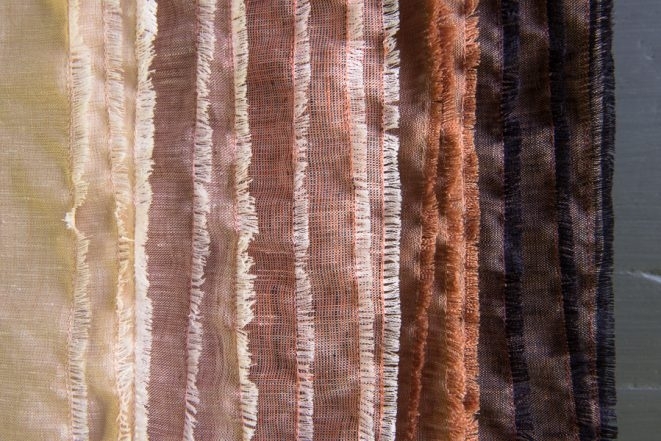 Washing the fabric makes fringing it a bit more challenging. 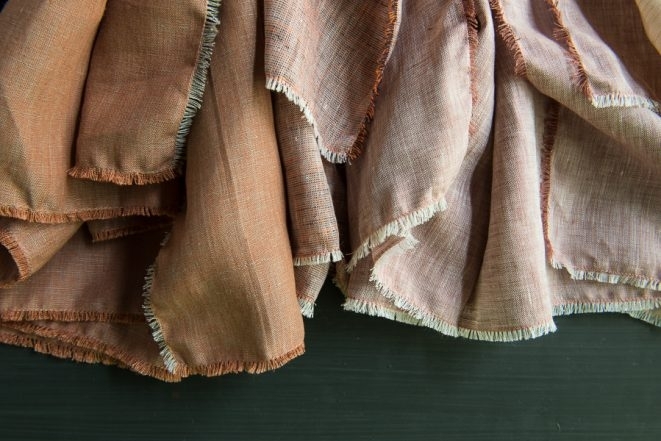 The sizing that comes on fabric helps to keep it even and this is immensely helpful with creating the fringed edges. 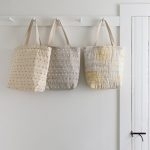 You can certainly use your washed fabric but it may be more challenging and less even. Additionally, we recommend only handwashing after the item is completed as the fringe an distort and become unruly in a washer. For the Watercolor Linen you will follow the exact same instructions as for the gauze! 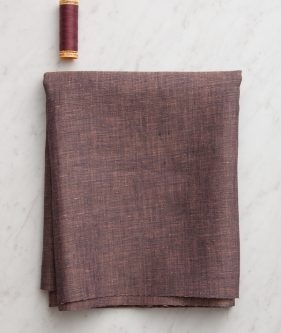 I am ordering Faded Indigo fabric for the Linen Wrap; what corresponding thread would you suggest that I use? Thanks for writing in! To match Faded Indigo, I would suggest either 9280 or 7510. Both would work well! I would like to make myself a wrap to wear with a very saturated red-orange dress. What fabric color would you recommend. Its a very saturated color….think tomato red. Thanks for writing in! I recommend Baked Clay or Monarch Gray. I don’t know exactly what your fabric looks like but I think these are best suited with a tomato-y red. Thanks again! Hello. 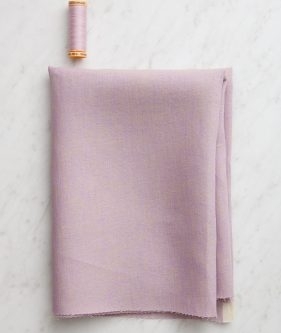 I have fallen in love with the linen fabric in the color “Rose Quartz”. However, I cannot seem to find the matching Guterman thread. You have listed a color number that does not appear. 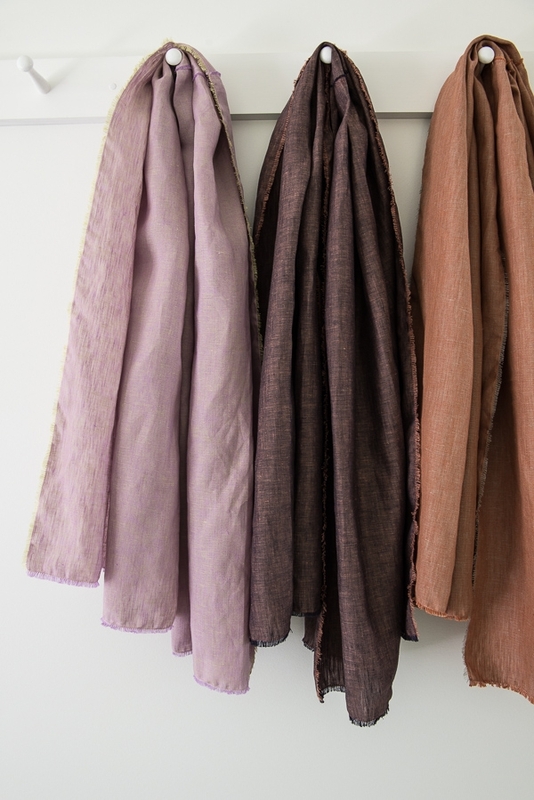 Would you please let me know which one to order with my linen wrap in Rose Quartz? Thanks for writing in! 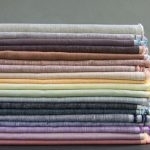 We do carry all of the colors of Gutermann thread listed above. The color that we used with Rose Quartz is 4680. There are so many colors of thread that you may need to expand the color selection to find the color. You will need to click on the “See all” text under the lower right hand side of the initial colors that do appear. 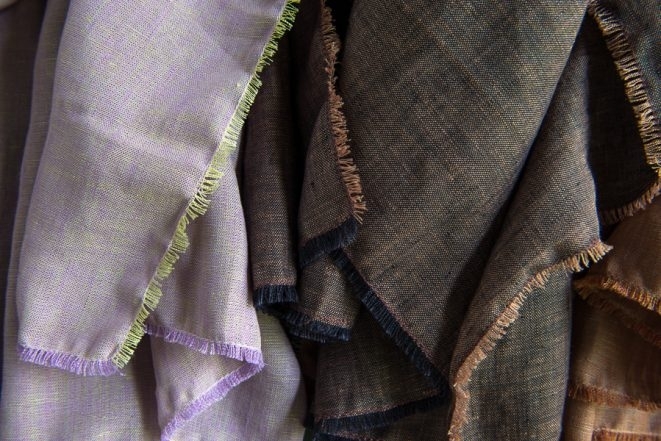 Hello, I love these wraps and I am ordering a couple of Linen cuts! one of them will be faded indigo but with a contrast color thread, like maybe 6110, 7850 or maybe 6000? any idea which would go better? I love your color choices! I think the 6000 would add an interesting pop of color! 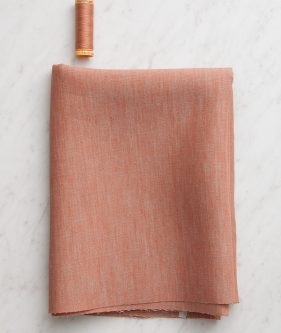 I would like to make the wrap in watercolor linen..since the fabric is 58-60 inches, could you not just make the wrap that length and then not have a seam down the middle? I guess I’m not understanding what the seam is all about..do you have a pattern drawn so I could see what the finished piece looks like? Thanks for writing in! You could certainly simplify the pattern to omit the seam if you would like! Due to the shifty nature of linen, we did trim down the edges quite a bit to ensure everything ended up straight along the grain and this was the best way we found to maximize the length of the wrap after straightening everything. Our finished wrap with the seam is 26″ wide by 63″ long, and after diagramming it out on paper, it looks like by simply trimming the yard of fabric to be straight along the grain, your wrap will be about 32″ wide by 58″ long. If you don’t mind sacrificing a bit of length this would certainly be a faster way to finish the wrap! 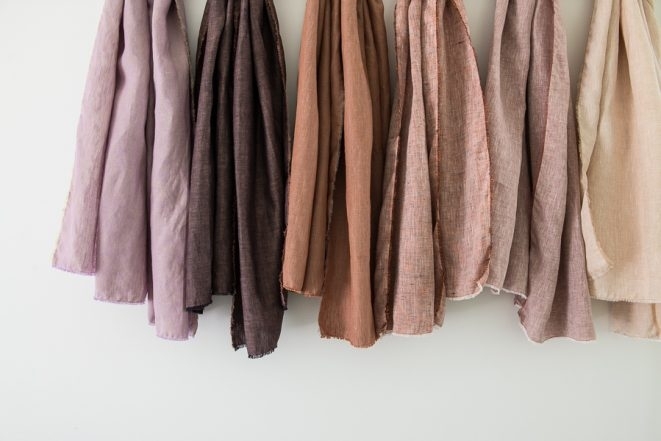 I have been waiting and waiting for the watercolor linen to be back in stock in the colors I would like….I especially want to try some of the darker shades for sashiko stitching!! How much longer will it take to be in stock? Thanks! Thanks for reaching out! 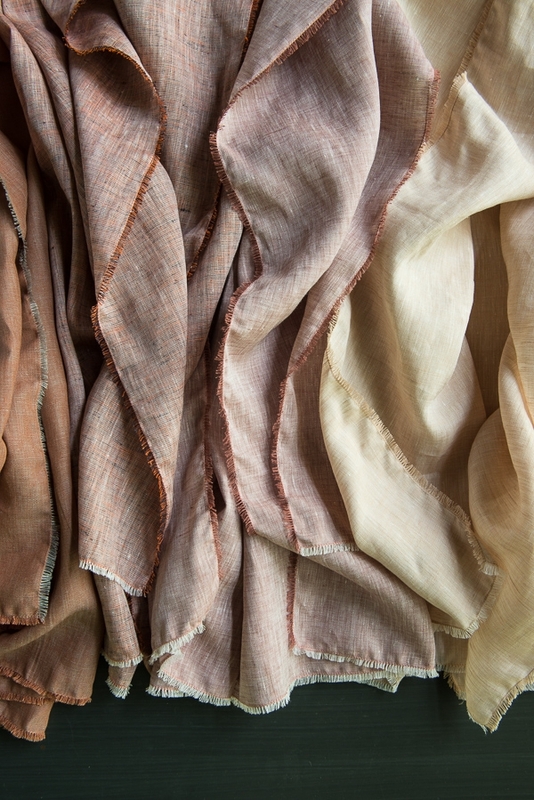 All colors of Watercolor Linen will be restocked – hopefully soon, although we do not have a firm ETA! Our mill is currently hard at work making more. You can sign up to be notified when we get it back in stock. To do so, go to the product page, select the color that you are interested in and enter your email address. When that color arrives, we will email you right away! What thread would you suggest for pink flame and foggy blue? Thanks for reaching out! I would suggest using Guttermann 5160 with Pink Flame, and 7380 with Foggy Blue.